A cup displayed at a private museum in southern Missouri was photographed by Robert Nordling, who sent a copy to the creationist Frank Lewis Marsh (1899-1992), emeritus Professor of Biology at Andrews University in Berrien Springs (Michigan, USA) on 10 January 1949. He forwarded it to Wilbert H Rusch (1913-1994) in 1966, who published an account in The Creation Research Society Quarterly 7 in 1971. Rusch was a Professor of Biology at Concordia College, Ann Arbor (Michigan, USA) and a founder of the Creation Research Society, for which he once served as President. The usual problems of anecdotal evidence are seen here. No matter how certain Frank Kenwood might have been that the vessel was firmly embedded in the coal, might it not have been in some smaller pieces of coal that had become cemented together? Might it have been a joke perpetrated on a credulous worker by a more sceptical colleague (such as the only apparent witness, Jim Stall, of whom nothing more than a name is known)? Typically for this sort of artefact, much heralded by Creationist writers, the chain of evidence for its origin is not good. I don’t like using the lack of real-time recording during excavation as an argument. Such recording may be good evidence, but it’s just not realistic. Most archaeological finds are not made with a camera rolling or a mass of (reliable) eyewitnesses watching, and to dismiss a find based on this, seems like a cheap shot to use. I share the opinion of Glen Kuban that analysis may suffice to determine whether it was embedded or not. I also agree that in a case like this, quick accretion is a likely culprit for embedding. In fact, basic logic proves it. Coal is formed under sustained intense pressure, and this iron pot is not deformed. If the pot WAS inside a lump of coal, it was not the result of classic coal formation but by another mechanism, such as the accretion of coal particles around the pot. I have read the comments and ridiculous explanations made by the person in charge of these articles, and I have to say that this person is no more than an evolution-obsessed short minded ignorant. For everybody to know, there is a different explanation for all these discoveries, and that is this: The Sedimentary layers are not Age layers, they point to the occurrence of a world wide flood, please see: https://www.youtube.com/watch?v=TWlNTLPozMo&list=FLKnZ2H8Psk-dUKguNiWsF_w&index=52. And knowing that, we will know that all these objects are not millions of years old. They are objects burried during the big Biblical flood, that has being recorded by every ancient culture around the world. 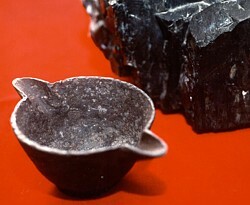 Including the Iron Cup from Oklahoma found inside a big chunk of Coal, which is not a fossil fuel as it’s said, and which formation doesn’t require millions of years neither, for that, please see: https://www.youtube.com/watch?v=rnpmy1ELk9U&list=FLKnZ2H8Psk-dUKguNiWsF_w&index=62. Thetre is a lot to know when there’s the will to know, eyes open. Please see Romans 1:18-28. Gonzalo, I am not “an evolution-obsessed short minded ignorant”. Evolution is a biological concept, not archaeological: I find it provides the best explanation for the biological diversity of our planet, but it has no bearing whatsoever on my understanding of archaeology or alleges “mysteries”. Rather, I suspect that you are the one who is “evolution-obsessed” in that you seem passionately to dislike its implications. You are the one who appears to me to be “short minded” if you can’t see (or are unwilling to see) what the evidence from multiple sources suggests. You can post as many links to ridiculous creationist YouTube videos as you like, but they are just plain wrong. 18 Ἀποκαλύπτεται γὰρ ὀργὴ θεοῦ ἀπ’ οὐρανοῦ ἐπὶ πᾶσαν ἀσέβειαν καὶ ἀδικίαν ἀνθρώπων τῶν τὴν ἀλήθειαν ἐν ἀδικίᾳ κατεχόντων, 19 διότι τὸ γνωστὸν τοῦ θεοῦ φανερόν ἐστιν ἐν αὐτοῖς, ὁ [a]θεὸς γὰρ αὐτοῖς ἐφανέρωσεν. 20 τὰ γὰρ ἀόρατα αὐτοῦ ἀπὸ κτίσεως κόσμου τοῖς ποιήμασιν νοούμενα καθορᾶται, ἥ τε ἀΐδιος αὐτοῦ δύναμις καὶ θειότης, εἰς τὸ εἶναι αὐτοὺς ἀναπολογήτους, 21 διότι γνόντες τὸν θεὸν οὐχ ὡς θεὸν ἐδόξασαν ἢ ηὐχαρίστησαν, ἀλλὰ ἐματαιώθησαν ἐν τοῖς διαλογισμοῖς αὐτῶν καὶ ἐσκοτίσθη ἡ ἀσύνετος αὐτῶν καρδία· 22 φάσκοντες εἶναι σοφοὶ ἐμωράνθησαν, 23 καὶ ἤλλαξαν τὴν δόξαν τοῦ ἀφθάρτου θεοῦ ἐν ὁμοιώματι εἰκόνος φθαρτοῦ ἀνθρώπου καὶ πετεινῶν καὶ τετραπόδων καὶ ἑρπετῶν. 24 [b]Διὸ παρέδωκεν αὐτοὺς ὁ θεὸς ἐν ταῖς ἐπιθυμίαις τῶν καρδιῶν αὐτῶν εἰς ἀκαθαρσίαν τοῦ ἀτιμάζεσθαι τὰ σώματα αὐτῶν ἐν [c]αὐτοῖς, 25 οἵτινες μετήλλαξαν τὴν ἀλήθειαν τοῦ θεοῦ ἐν τῷ ψεύδει, καὶ ἐσεβάσθησαν καὶ ἐλάτρευσαν τῇ κτίσει παρὰ τὸν κτίσαντα, ὅς ἐστιν εὐλογητὸς εἰς τοὺς αἰῶνας· ἀμήν. 26 Διὰ τοῦτο παρέδωκεν αὐτοὺς ὁ θεὸς εἰς πάθη ἀτιμίας· αἵ τε γὰρ θήλειαι αὐτῶν μετήλλαξαν τὴν φυσικὴν χρῆσιν εἰς τὴν παρὰ φύσιν, 27 ὁμοίως τε καὶ οἱ ἄρσενες ἀφέντες τὴν φυσικὴν χρῆσιν τῆς θηλείας ἐξεκαύθησαν ἐν τῇ ὀρέξει αὐτῶν εἰς ἀλλήλους, ἄρσενες ἐν ἄρσεσιν τὴν ἀσχημοσύνην κατεργαζόμενοι καὶ τὴν ἀντιμισθίαν ἣν ἔδει τῆς πλάνης αὐτῶν ἐν [d]ἑαυτοῖς ἀπολαμβάνοντες. (18 God shows his anger from heaven against all the evil and wrong things that people do. Their evil lives hide the truth they have. 19 This makes God angry because they have been shown what he is like. Yes, God has made it clear to them. 20 There are things about God that people cannot see—his eternal power and all that makes him God. But since the beginning of the world, those things have been easy for people to understand. They are made clear in what God has made. So people have no excuse for the evil they do. 21 People knew God, but they did not honor him as God, and they did not thank him. Their ideas were all useless. There was not one good thought left in their foolish minds. 22 They said they were wise, but they became fools. 23 Instead of honoring the divine greatness of God, who lives forever, they traded it for the worship of idols—things made to look like humans, who get sick and die, or like birds, animals, and snakes. I’m unclear how the ramblings of Paul have any bearing on this object. I agree with OP that you seem to be pushing evolution. Your argument equates to “This discovery doesn’t fit evolution so ignore it.” What was the point of writing this? I’d like to see more than opinionated accusations of ‘anecdotal evidence’. Keith Fitzpatrick-Matthews just wants to point out the lack of sufficent documentation on where and how this pot was found. The thought patterns of modern scientis is very different from that of Creationists. There is NO predetermined “evolutionary” timeline. It is just that not a single human fossil have ever been found in any Late Carboniferous/Pensylvanian rock layer. In fact, there is not a single mamalian fossil in any these layers. In contrast, there are myriads of mamalian fossils from the Jurrasic, Cretaceous, Tertiary and Quaternary. There might be plenty such from the Permian and Triassic too depending on where you draw the line between reptiles and mamals (it far from obvious). Human remains are only found in Quaternary rock layers and possibly the very latest of the Tertiary ones. There is a simple, logical explantion for such patterns: the lifeforms in question did not exist until then! I came up with one more reason why this pot can’t have been embedded in the coal when it formed. Coal is basically petrified peat. Under the circumstances peat is formed iron does not last very long. I have a fuzzy memory of an Iron Age toolbox which was found buried in a peat bog. This was here in Scandinavia where the Iron Age started around 500 BC. When the toolbox was found all the iron had entirely rusted away. Only the wooden handles of the tools had been preserved by the oxygen-free, acid environment. Maybe Keith Fitzpatrick-Matthews can verify this? Whenever I see religious verses used in a science discussion, I can’t help but laugh. I live in the Pennsylvania Anthracite coal region. My Dad was a coal miner most of his life, he even was the owner of two different small drift mines. His most remarkable find was a rather large fossilized fish in the mud shale overburden. He bragged about it in a bar, and someone stole it from his mining shed. But he often talked about finding huge fossilized trunks and stumps of trees. And everyone who lives around here knows about fossilized ferns and other leaves, they are easy for anyone to find who wants to go picking in a culm bank. My point his this, and people with a basic understanding of geological processes know this. The intense pressure actually is necessary for the preservation of even soft tissue. Without it, a fossil will not be formed. The muck of a swamp, the mud of a lake, the sand of a river or ocean surround the tissue, successive layers cover it over, and it’s protected from rapid decay Same thing for a dinosaur bone. An iron pot or any other metallic object will be very well preserved in the anerobic (low oxygen) environment of swamp muck. They dig up human corpses in the Irish peat bogs with amazing frequency, thousands of years old. I don’t think humans were on earth 300 million years ago. Some other intelligent creature was visiting, and throwing it’s garbage around! Science is no longer the search for truth but the defence of a worldview. No matter what evidence you present the response will be to dismiss it and the person who presents it out of hand. Look what happened to the scientist who supported intelligent design. I have relative who is an engineer/physistic whose response to anything that contradicted accepted evolution/archaeology dogma is to say “it is all fake. They have to be fakes because evolution is a undisputed fact.” Science is based on the philosophy of materialism. Therefore there is no room in their thinking for anything that is not within the materialistic paradigm. They could be the one that digs up the out of place artefact in a coal seam and refuse to accept the possibility that their view of evolution is incorrect. Science is the new religion and it will not tolerate unbelievers or heretics. I have an open mind to the possibility that we have got it wrong. However, do not believe anything without verification of the source material. There are a lot of liars and fraud artists who say and do anything to get your attention and/or your money ! In fact, there are very few scientists who support intelligent design. Pretty much the only one who is a practicising scientist in a relevant field is Behe, and he did an excellent job of discrediting himself in court at Dover. And in case you were going to raise the Discovery Institute’s “dissenters list”, don’t bother – the way it’s phrased, any practicising biologist, Dawkins included, could sign it without surrendering one iota of a commitment to the Theory of Evolution – their only qualm, in fact, would be knowing that the DI would use it to make claims far beyond what the statement actually says. And I’m sorry, evolution is a fact – it has been observed in nature and in the laboratory, as well as in numerous farmyards over the last few thousand years. The _Theory of Evolution_ isn’t a fact – but it is as well established as any other theory in science, and far better than many. Next point: Science isn’t based on a philosophy of materialism, but uses naturalism as a practical tool. If it were philosophical, it would be impossible to be a scientist without also being an atheist, and there are a great many priests and monks who can demonstrate the invalidity of that. And the use of operation naturalism is part of the rules of science – if your explanation of some phenomenon involves gods, angels, demons, pixies (or unevidenced aliens or Atlanteans, come to that), then your explanation isn’t scientific, because there is no way to support or refute it with evidence. And your point that science is all about supporting the current dogma does nothing but demonstrate you lack of understaning about how science works. Nobody don’t get Nobel prize for “supporting the accepted dogma”; they get Nobel prizes for kicking the accepted dogma in the teeth and jumping up and down on the remains. Finally, your claim that “Science is the new religion and it will not tolerate unbelievers or heretics” is laughably wrong. The biggest strength of science is its willingness to admit that it’s wrong. Yes, it often takes a long time, and yes, it can be difficult to change the current consensus – but that’s because science (totally unlike religion) requires evidence; and the current consensus _is_ the current consensus because there is considerable evidence to support the consensus, so a “heretic” who wishes to overturn that consensus needs really convincing evidence to do so. And to reiterate my earlier point, it’s the successful heretics who get Nobel prizes. Well you’ve convinced me not to use the iron pot as evidence of creation and personally I’d would hate to be the person who’s linchpin of faith(or lack there of) was that damned old iron pot. LOL And regardless I will keep on believing that my closest ancestor of origins is God not primate, that I came from something not nothing,that when I die I won’t but instead I will still live on, that science cannot explain life but only stand in awe of it, that evolution will never in a billion years explain things like love or human consciousness( and please don’t try I’ve already heard from the best and it was very unsatisfactory). What I don’t understand is why the people who truly believe in truest and purest forms of evolution even care at all what the unbelievers say? If evolution is true then there is literally no purpose to life so why care at all ? The second I had the revelation that evolution was true I would of immediately stopped pursuing anymore thought on the idea and lived out the rest of my short meaningless life enjoying all the pleasures this world had to offer because ultimately if evolution is true then that’s all you are gonna get, the pinnacle of life is to please,preserve, and pleasure oneself. The meaning of life is “Me” because when I die it didn’t matter anyways,I’ll just become some cosmic dust to be recycled in a trillion years. And any ideal that teaches anything other than evolution’s self centeredness was created by others to brainwash you into serving their selfish ideals. Every single ideology no matter how benign or how outlandish is meaningless, is neither true or false because in evolution ideals such as right and wrong are false right? Whether I teach a philosophy espousing the virtues of murdering 60 million or I teach to love and care for the needy matters not in realization that over billions of years ago we came from nothing and to that nothing we shall return. Evolution being true then every single notion of what matters and what matters not really doesn’t matter, if one is being logical and at least truthful with oneself. We might collectively agree that stealing is wrong but according to evolution it is neither right or wrong. Collective agreeing on right or wrong is just self preservation but logically deep down inside you really shouldn’t care if someone steals from you or murders you because you truly believe in evolution and logically understand the ramifications of living in a world that came from zero,nada,nothing and to that you shall return because evolution is the be all end all. So what I still don’t understand is why defend evolution so vehemently when it all really doesn’t matter? To me the fact you would so vigorously defend an idea like evolution proves that it is not true because if it were true you would not care, you would not defend it, evolution cannot explain why you care about what someone says about a iron pot found in some coal. And please do not respond to me about the virtues of evolution and high moral purpose it can instill in humanity, all lies no one really believes. I know that God is Love(the very idea of love comes from God, not man) and we need love but evolution cannot explain our need for love or why love is greater than hate. Evolution cannot even explain a concept such as love or happiness or joy for they are alien to it, higher human consciousness will never be satisfactorily explained as chemical reactions when the reality is that it is way more complicated than that.